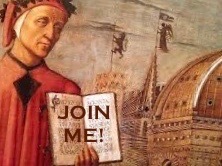 The Dante Alighieri Society of Santa Cruz is a 501(c)(3)corporation. REGISTER FOR ITALIAN LANGUAGE CLASSES NOW! 2019 WINTER/SPRING ITALIAN FILM SERIES: "Mistaken Identity"
Your memberships help pay for our language classes, film and lecture series, scholarships, and other activities promoting Italian culture. To join, click on Be a Member!. Congratulations to Valentin Barbosa and Alondra Salcedo, our 2019 Dante Alighieri Cabrillo College Scholarship Winners!